VProof 3mm & 4mm is a high performance polymer modified Plastomeric bituminous waterproofing membrane surfaced with reflective natural colors slates to provide maximum protection against UV. The presence of the slates provides a mechanical protection against light foot traffic and occasional maintenance as well as offering an aesthetic surface. 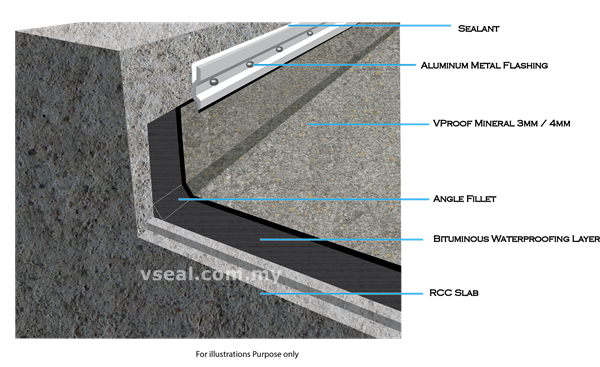 It is a perfect solutions for the exposed flat roof ,where is can be laid over the existing surface and providing an cost efficient and effective solutions to leaking roof. Excellent and Durable for tropical climates and light foot traffic. Our Team will help you to diagnose and provide you an appropriate solution!